Arch Pain What Are The Causes ? The arch of the foot is a collection of bones, ligaments, tendons, and muscles that are constructed to allow your foot to bear the weight of your body safely. These tissues and bones of your arch are in constant motion as you walk and run, absorbing impacts that might otherwise injure you. The arch of your foot has its limits, however, and arch pain can be a sign that you?ve passed those limits and injured yourself. Pay close attention to any pain you are feeling in your foot. What may seem at first to be simple soreness from being on your feet all day could be a sign of a more serious stress injury or repeated motion injury. Arch pain could also be a result of a fall or impact injury, so be sure to seek proper treatment. The doctor will take a brief history to determine how the injury occurred. If necessary, a thorough physical exam may be conducted to evaluate for any other injuries. Taking your workout shoes to the exam may also provide valuable information to the medical practitioner. Both feet will be physically and visually examined by the medical practitioner. The foot and arch will be touched and manipulated possibly with a lot of pressure and inspected to identify obvious deformities, tender spots, or any differences in the bones of the foot and arch. 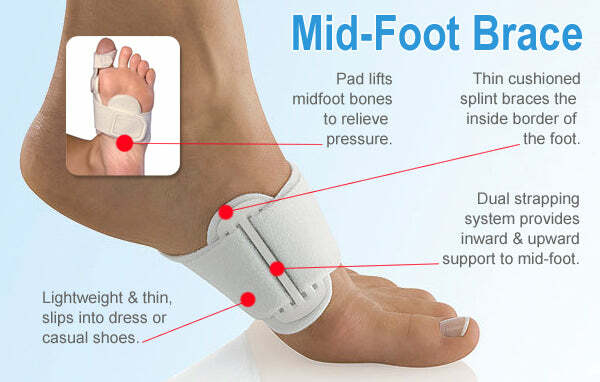 The most effective treatment for foot arch pain and strain is to use an arch support. The arch support sits under the foot and stops the arch of the foot from collapsing, thereby preventing the stretch of the arch pad which causes pain and discomfort. Wearing an arch support in slippers or house shoes can also prevent pain in the mornings when discomfort it most common and severe. Arch supports usually relieve symptoms within a few days. The procedure involves cutting and shifting the bone, and then performing a tendon transfer. First, the surgeon performs a calcaneal osteotomy, cutting the heel bone and shifting it into the correct position. Second, the surgeon transfers the tendon. Reroute the flexor digitorum to replace the troublesome posterior tibial tendon. Finally, the surgeon typically performs one or more fine-tuning procedures that address the patient?s specific foot deformity. Often, the surgeon will lengthen the Achilles tendon because it is common for the mispositioned foot to cause the Achilles to tighten. Occasionally, to increase the arch, the surgeon performs another osteotomy of one of the bones of the midfoot. Occasionally, to point the foot in a straightforward direction, the surgeon performs another osteotomy of the outside portion of the calcaneus. Strap the arches into the anatomically correct positions with athletic tape and leave them like this for some time. If the fallen arches are an issue with the muscular structure, this may give the muscles an opportunity to strengthen. This is definitely not a fallen arches cure all the time but it can help prevent it more times than not. Ask a doctor or physical therapists to show you how to do this taping. Find shoes that fit. This may require that you get your foot measured and molded to ensure that the shoe will fit. Shoes that are too big, too tight or too short, may not directly cause the fallen arches, but they can assist with the damage to the area. These shoes should have thick cushioning inside and have plenty of room for your toes. Walk without shoes as much as possible. Shoes directly assist with weakening and distorting the arches of the feet so going without shoes can actually help strengthen your arches and prevent fallen arches. Walking on hard and bumpy surfaces barefooted makes the muscles in your feet strengthen in order to prevent injury. It is a coping mechanism by your body. Insert heel cups or insoles into the shoes that you wear the most. Many people wear uncomfortable shoes to work and these are the same shoes that cause their arches the most problems. Inserting the heel cups and insoles into these shoes can prevent fallen arches from occurring. Many people place these inserts into all their shoes to ensure support. Ask a medical professional, either your doctor or a physical therapist, about daily foot exercises that may keep the arches stronger than normal. Many times, you can find exercises and stretches on the Internet on various websites. Curling your toes tightly and rotating your feet will help strengthen your longitudinal arches. Relax your feet and shake them for a minute or so before you do any arch exercises. This will loosen the muscles in your feet that stay tight due to normal daily activities. Wear rigid soled sandals whenever possible to provide a strong support for your arches. Wooden soled sandals are the best ones if available. Walk or jog on concrete as much as you can. This will create a sturdy support for your arches. Running or walking in sandy areas or even on a treadmill, does not give rigid support. 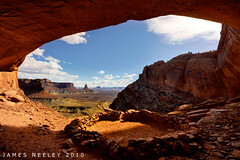 Instead, these surfaces absorb the step, offering no support for arches. People with flexible feet who develop fallen arches may benefit from foot strengthening exercises, notes the Nicholas Institute of Sports Medicine and Athletic Trauma. Standing on a towel in bare feet and grasping the material with the toes is an easy foot-strengthening exercise that can be done at home. Standing on one leg while arching and releasing the foot may also prove useful. Doctors may prescribe gentle stretching exercises for the foot and ankle tendons. One in four adults in the U.S. has adult acquired flatfoot deformity, which may begin during childhood or be acquired with age. The foot may be flat all the time or may lose its arch when the person stands. The most common and serious cause of flat foot is Posterior Tibial Tendon Dysfunction, in which the main tendon that supports the arch gradually weakens. There are numerous causes of acquired adult flatfoot, including fracture or dislocation, tendon laceration, tarsal coalition, arthritis, neuroarthropathy, neurologic weakness, and iatrogenic causes. The most common cause of acquired adult flatfoot is posterior tibial tendon dysfunction. Many patients with this condition have no pain or symptoms. When problems do arise, the good news is that acquired flatfoot treatment is often very effective. Initially, it will be important to rest and avoid activities that worsen the pain. Because of the progressive nature of PTTD, early treatment is critical. If treated soon enough, symptoms may resolve without the need for surgery and progression of the condition can be stopped. If left untreated, PTTD may create an extremely flat foot, painful arthritis in the foot and ankle, and will limit your ability to walk, run, and other activities. Your podiatrist may recommend one or more of these non-surgical treatments to manage your PTTD. Orthotic devices or bracing. To give your arch the support it needs, your foot and ankle surgeon may recommend an ankle brace or a custom orthotic device that fits into your shoe to support the arch. Immobilization. A short-leg cast or boot may be worn to immobilize the foot and allow the tendon to heal. Physical therapy. Ultrasound therapy and stretching exercises may help rehabilitate the tendon and muscle following immobilization. Medications. Nonsteroidal anti-inflammatory drugs (NSAIDs), such as ibuprofen, help reduce the pain and inflammation. Shoe modifications. Your foot and ankle surgeon may recommend changes in your footwear. For more chronic flatfoot pain, surgical intervention may be the best option. Barring other serious medical ailments, surgery is a good alternative for patients with a serious problem. There are two surgical options depending on a person?s physical condition, age and lifestyle. The first type of surgery involves repair of the PTT by transferring of a nearby tendon to help re-establish an arch and straighten out the foot. After this surgery, patients wear a non-weight bearing support boot for four to six weeks. The other surgery involves fusing of two or three bones in the hind foot below the ankle. While providing significant pain relief, this option does take away some hind foot side-to-side motion. Following surgery, patients are in a cast for three months. Surgery is an effective treatment to address adult-acquired flatfoot, but it can sometimes be avoided if foot issues are resolved early. That is why it is so important to seek help right away if you are feeling ankle pain. But perhaps the best way to keep from becoming flatfooted is to avoid the risk factors altogether. This means keeping your blood pressure, weight and diabetes in check. The Achilles tendon is the thickest and strongest tendon in the human body. It plays a very important role in most sport activities and is particularly vulnerable to overloading from repetitive running and jumping. The Achilles tendon forms a joint distal tendon for the gastrocnemius and the soleus muscles. These muscles combine to form the triceps surae muscle. Athletes who sustain Achilles tendon ruptures most frequently are those who participate in ball sports that demand rapid changes of direction and quick, reactive jumps (e.g., tennis, squash, badminton, and soccer), in addition to runners and jumpers in track and field. Sometimes a patient with a ruptured tendon has a history of long-term pain localized to the tendon, but more often the rupture occurs without warning. Such ruptures are often caused by degenerative changes in the tendon (tendinosis), usually in the segment of the tendon that has the worst blood supply. This segment extends from 2 to 6 cm proximal to the insertion of the tendon onto the calcaneus. People who commonly fall victim to Achilles rupture or tear include recreational athletes, people of old age, individuals with previous Achilles tendon tears or ruptures, previous tendon injections or quinolone use, extreme changes in training intensity or activity level, and participation in a new activity. 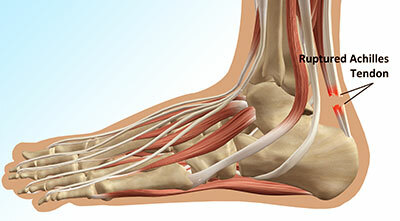 Most cases of Achilles tendon rupture are traumatic sports injuries. The average age of patients is 29-40 years with a male-to-female ratio of nearly 20:1. Fluoroquinolone antibiotics, such as ciprofloxacin, and glucocorticoids have been linked with an increased risk of Achilles tendon rupture. Direct steroid injections into the tendon have also been linked to rupture. Quinolone has been associated with Achilles tendinitis and Achilles tendon ruptures for some time. Quinolones are antibacterial agents that act at the level of DNA by inhibiting DNA Gyrase. DNA Gyrase is an enzyme used to unwind double stranded DNA which is essential to DNA Replication. Quinolone is specialized in the fact that it can attack bacterial DNA and prevent them from replicating by this process, and are frequently prescribed to the elderly. Approximately 2% to 6% of all elderly people over the age of 60 who have had Achilles ruptures can be attributed to the use of quinolones. Patients who suffer an acute rupture of the Achilles tendon often report hearing a ?pop?or ?snap.? Patients usually have severe pain the back of the lower leg near the heel. This may or may not be accompanied by swelling. Additionally, because the function of the Achilles tendon is to enable plantarflexion (bending the foot downward), patients often have difficulty walking or standing up on their toes. With a complete rupture of the tendon, the foot will not move. In cases where the diagnosis is equivocal, your physician may order an MRI of the leg to diagnose a rupture of the Achilles tendon. The diagnosis is usually made on the basis of symptoms, the history of the injury and a doctor's examination. The doctor may look at your walking and observe whether you can stand on tiptoe. She/he may test the tendon using a method called Thompson's test (also known as the calf squeeze test). In this test, you will be asked to lie face down on the examination bench and to bend your knee. The doctor will gently squeeze the calf muscles at the back of your leg, and observe how the ankle moves. If the Achilles tendon is OK, the calf squeeze will make the foot point briefly away from the leg (a movement called plantar flexion). This is quite an accurate test for Achilles tendon rupture. If the diagnosis is uncertain, an ultrasound or MRI scan may help. An Achilles tendon rupture is sometimes difficult to diagnose and can be missed on first assessment. It is important for both doctors and patients to be aware of this and to look carefully for an Achilles tendon rupture if it is suspected. Non-surgical management traditionally was selected for minor ruptures, less active patients, and those with medical conditions that prevent them from undergoing surgery. It traditionally consisted of restriction in a plaster cast for six to eight weeks with the foot pointed downwards (to oppose the ends of the ruptured tendon). But recent studies have produced superior results with much more rapid rehabilitation in fixed or hinged boots. Regaining Achilles tendon function after an injury is critical for walking. The goal of Achilles tendon repair is to reconnect the calf muscles with the heel bone to restore push-off strength. Those best suited for surgical repair of an acute or chronic Achilles tendon rupture include healthy, active people who want to return to activities such as jogging, running, biking, etc. Even those who are less active may be candidates for surgical repair. Non-operative treatment may also be an option. The decision to operate should be discussed with your orthopaedic foot and ankle surgeon. Achilles Tendon Rupture How Do I Know I Have Got One? The Achilles tendon is the largest and strongest tendon in the body. 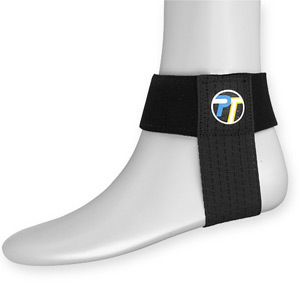 It functions to help control the foot when walking and running. Ruptures of the Achilles tendon commonly occur in individuals in their 30s and 40s. This age group is affected because these patients are still quite active, but over time their tendons tend to become stiffer and gradually weaken. These ruptures usually occur when an athlete loads the Achilles in preparation to pushing off. This can occur when suddenly changing directions, starting to run, or preparing to jump. These ruptures occur because the calf muscle generates tremendous force through the Achilles tendon in the process of propelling the body. Patients will feel a sharp intense pain in the back of their heel. Patients often initially think that they were ?struck in the back of the heel? and then realize that there was no one around them. After the injury, patients will have some swelling. If they can walk at all, it will be with a marked limp. It is very rare that a rupture of the Achilles is partial. However, a painful Achilles tendonitis or a partial rupture of the calf muscle (gastrocnemius) as it inserts into the Achilles can also cause pain in this area. The pain of an Achilles rupture can subside quickly and this injury may be misdiagnosed in the Emergency Department as a sprain. Important clues to the diagnosis are an inability to push off with the foot and a visible or palpable defect just above the heel bone in the back of the leg. Tendon strain or tendon inflammation (tendonitis) can occur from tendon injury or overuse and can lead to a rupture. Call your doctor if you have signs of minor tendon problems. Minor tenderness and possible swelling increases with activity. There is usually no specific event causing sudden pain and no obvious gap in the tendon. You can still walk or stand on your toes. Acute calf pain and swelling can indicate a tear or partial tear of the Achilles tendon where it meets the calf muscle. You may still be able to use that foot to walk, but you will need to see a specialist such as an orthopedic surgeon. Surgery is not usually done for partial tears. Sometimes special heel pads or orthotics in your shoes may help. Follow up with your doctor to check for tendonitis or strain before resuming activity, because both can increase the risk of tendon rupture. Any acute injury causing pain, swelling, and difficulty with weight-bearing activities such as standing and walking may indicate you have a tear in your Achilles tendon. Seek prompt medical attention from your doctor or emergency department. Do not delay! Early treatment results in better outcome. If you have any question or uncertainty, get it checked. It is usually possible to detect a complete rupture of the Achilles tendon on the history and examination. A gap may be felt in the tendon, usually 4-5cm above the heel bone. This is the normal site of injury and is called an intra-substance tear. The tear can occur higher up about 10cm above the insertion into the heel at the site where the muscles join the tendon, this is known as a musculo-tendinous tear. A special test will be performed which involves squeezing the calf. Normally if the Achilles tendon is intact this causes the foot to point downwards but if it is ruptured it causes no movement. To confirm the diagnosis and the exact site of the rupture it may be necessary to perform an Ultra-sound or MRI scan. Nonsurgical treatment involves extended casting, special braces, orthotics, and physical therapy. Avoids the normal complications and expenses of surgery. Some studies show the outcome is similar to surgery in regard to strength and function. There is risk of an over-lengthened tendon with inadequate tension. Extended immobilization can lead to more muscle weakness. Nonsurgical treatment has a higher incidence of re-rupture than surgical repair. Nonsurgical treatment is often used for nonathletes or for those with a general low level of physical activity who would not benefit from surgery. The elderly and those with complicating medical conditions should also consider conservative nonsurgical treatment. Achilles tendinitis is an irritation/inflammation in the achilles tendon, which attaches to the back of the heel. It is often a result of overuse and occurs frequently in runners who have altered their training suddenly, either with regard to duration or intensity. This injury is also prevalent in middle-aged people who are active. There are a number of ways a person can develop Achilles tendinitis. Some causes are easier to avoid than others, but being aware of them can aid earlier diagnosis and help prevent serious injury. Causes of Achilles tendinitis include, using incorrect or worn out shoes when running or exercising. Not warming up properly before exercise. Increasing intensity of exercise too quickly (e.g. running speed or distance covered). Prematurely introducing hill running or stair climbing to exercise routine. Running on hard or uneven surfaces. Calf muscle is injured or has little flexibility (this puts a lot of strain on the Achilles tendon). Sudden intense physical activity such as sprinting for the finish line. Achilles tendinitis can also be caused by differences in foot, leg or ankle anatomy. For example, some people can have flatness in their foot where there would normally be an arch; this puts more strain on the tendon. The FDA has asked that a boxed warning be added to the prescribing information for fluoroquinolone antibiotics. Patients taking these drugs may experience an increased risk of tendinitis and tendon rupture. Fluoroquinolones include Cipro (ciprofloxacin), Factive (gemifloxacin), Levaquin (levofloxacin), Avelox (moxifloxacin), Noroxin (norfloxacin), Floxin (ofloxacin) and Proquin (ciprofloxacin hydrochloride). It is important to remember that the risk for injury is not necessarily gone when the drug is stopped. Cases have been reported in which tendon problems occurred up to several months after the drug was discontinued. Most cases of Achilles tendonitis start out slowly, with very little pain, and then grow worse over time. Some of the more common symptoms include mild pain or an ache above the heel and in the lower leg, especially after running or doing other physical activities, pain that gets worse when walking uphill, climbing stairs, or taking part in intense or prolonged exercise, stiffness and tenderness in the heel, especially in the morning, that gradually goes away, swelling or hard knots of tissue in the Achilles tendon, a creaking or crackling sound when moving the ankle or pressing on the Achilles tendon, weakness in the affected leg. During an examination of the foot and ankle, you doctor will look for the following signs, Achilles tendon swelling or thickening. Bone spurs appearing at the lower part of the tendon at the back of the hell. Pain at the middle or lower area of the Achilles tendon. Limited range of motion of the foot and ankle, and a decreased ability to flex the foot. Your doctor may perform imaging tests, such as X-rays and MRI scans, to make a diagnosis of Achilles tendinitis. X-rays show images of the bones and can help the physician to determine if the Achilles tendon has become hardened, which indicated insertional Achilles tendinitis. MRI scans may not be necessary, but they are important guides if you are recommended to have surgical treatment. An MRI can show the severity of the damage and determine what kind of procedure would be best to address the condition. The initial aim of the treatment in acute cases is to reduce strain on the tendon and reduce inflammation until rehabilitation can begin. This may involve, avoiding or severely limiting activities that may aggravate the condition, such as running or uphill climbs. Using shoe inserts (orthoses) to take pressure off the tendon. Wear supportive shoes. Reducing Inflammation by icing. Taking non-steroidal anti-inflammatory drugs. Heel cups and heel lifts can be used temporarily to take pressure off the tendon, but must not be used long term as it can lead to a shortening of the calf. Calf Compression Sleeves. Placing the foot in a cast or restrictive ankle-boot to minimize movement and give the tendon time to heal. This may be recommended in severe cases and used for about eight weeks. Most people will improve with simple measures or physiotherapy. A small number continue to have major problems which interfere with their lifestyle. In this situation an operation may be considered. If an operation is being considered, the surgeon will interview you and examine you again and may want you to have further treatment before making a decision about an operation. Before undergoing Achilles tendonitis surgery, London based patients, and those who can travel, will be advised to undergo a scan, which will reveal whether there is a problem in the tendon which can be corrected by surgery. Patients will also have the opportunity to ask any questions and raise any concerns that they may have, so that they can proceed with the treatment with peace of mind. Warm up slowly by running at least one minute per mile slower than your usual pace for the first mile. Running backwards during your first mile is also a very effective way to warm up the Achilles, because doing so produces a gentle eccentric load that acts to strengthen the tendon. Runners should also avoid making sudden changes in mileage, and they should be particularly careful when wearing racing flats, as these shoes produce very rapid rates of pronation that increase the risk of Achilles tendon injury. If you have a tendency to be stiff, spend extra time stretching. If you?re overly flexible, perform eccentric load exercises preventively. Lastly, it is always important to control biomechanical alignment issues, either with proper running shoes and if necessary, stock or custom orthotics. Flat feet and fallen arches are common conditions that are in most cases asymptomatic. However, in patients who do have symptoms, treatments are available that can help reduce pain and promote efficient movement. Orthotic devices are well recognised as an excellent treatment and podiatrists can offer these different treatment modalities as individualised treatments for patients. Many people have flat feet and notice no problems and require no treatment. But others may experience the following symptoms, Feet tire easily, painful or achy feet, especially in the areas of the arches and heels, the inside bottom of your feet become swollen, foot movement, such as standing on your toes, is difficult, back and leg pain, If you notice any of these symptoms, it's time for a trip to the doctor. The type of treatment will depend on the stage of PTTD present. There are four stages of posterior tibial tendon dysfunction. Stage I. The posterior tibial tendon is inflamed but has normal strength. There is little to no change in the arch of the foot. The patient can still perform a single-limb heel rise and has a flexible hindfoot. Orthotic treatment options include modified off the shelf inserts and custom molded orthotics. Stage 2. The tendon is partially torn or shows degenerative changes and as a result loses strength.There is considerable flattening of the arch without arthritic changes in the foot. The patient cannot perform single-limb heel rise. Pain is now present on the lateral aspect of the ankle. Orthotic treatment is similar as that in stage I, with the addition of more rigid arch supports and wedging. Stage 3. Results when the posterior tibial tendon is torn and not functioning. As a result the arch is completely collapsed with arthritic changes in the foot. A solid ankle AFO is suggested in conjunction with a modified orthopedic shoe. Stage 4. Is identical to stage three except that the ankle joint also becomes arthritic. A rigid AFO and modified orthopedic shoe is required. Feet that do not respond to the treatments above may need surgery. The surgery will help to create a supportive arch.